This agreement is designed for a sale leaseback transaction in which an investor purchases property owned by the tenant and leases it back to the tenant following the purchase. This is essentially a financing transaction, making the investor most anxious to use a lease that protects his new cash flow stream as a return on his investment. THIS LEASE (the “Lease”) dated as of ____________, 20__, between Commercial Property Landlord LLC, a _________________ limited company having an address at _______________, as Landlord, and Acceptable Tenant, Inc., a _________________ corporation, having an address of , _________________, as Tenant, of premises known as ___________________ _________________. 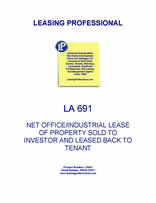 WHEREAS, as a condition to Landlord's acquisition of the Demised Premises and of Tenant's disposition of the Demised Premises, Landlord now desires to lease the Demised Premises to Tenant and Tenant now desires to lease the Demised Premises from Landlord all upon the terms and conditions herein set forth. Landlord hereby leases to Tenant, and Tenant hereby leases from Landlord, the premises outlined in red and shown on the plan annexed hereto as Exhibit A, with all the appurtenances belonging thereto, containing an aggregate area of approximately ______________ square feet, the legal description of which is set forth on Exhibit I annexed hereto. Condition of the Premises. Tenant expressly understands and agrees and acknowledges that Landlord would not have entered this Lease or acquired the Demised Premises without the express provisions of this Article 1. It is understood that the Demised Premises and all improvements and fixtures (including, without limitation, the Building) shall be delivered "AS IS" in their present condition and with all faults. Landlord shall not be liable for any latent or patent defects in the Demised Premises. Tenant acknowledges that neither Landlord nor any of its representatives, employees, officers, directors, shareholders, trustees, members, partners, counsel or agents has made (and Landlord hereby disclaims) any representations or warranties, express or implied, as to the physical condition, state of repair, tenancy, income, expenses or operation of the Demised Premises. Tenant acknowledges that it has not relied on any representations, warranties or "broker set-ups" in its decision to lease the Demised Premises in accordance with the terms hereof and also acknowledges that Tenant is intimately familiar with the Demised Premises due to its previous ownership of same. In particular, except as herein specifically set forth, Landlord is unwilling to make any representations or warranties in respect of (i) the physical condition of the Demised Premises (including, without limitation, in respect of the presence, non-presence or condition of hazardous, toxic or other environmentally sensitive materials or substances), (ii) the compliance or non-compliance of the Demised Premises with applicable laws (including, without limitation, those relating to the protection of the environment or the safety of employees or workers), (iii) the revenues, income or expenses of the Demised Premises, (iv) the adequacy or inadequacy of the utilities, if any, provided to the Demised Premises, (v) the zoning of the Demised Premises or (vi) any other matter concerning the Demised Premises. Tenant acknowledges the foregoing and warrants and represents that it (or its principal officers if Tenant shall be an entity) has had sufficient time and opportunity to inspect the Demised Premises and other matters deemed important to Tenant, that it (or its principal officers if Tenant shall be an entity) is experienced in owning real property similar to the Demised Premises and that it is represented by advisors and counsel of its choosing and that Tenant is intimately familiar with the Demised Premises due to its previous ownership of same. A. The original term of this Lease (hereinafter the "Original Term") shall commence on the "Commencement Date" (as defined in paragraph B of this Article) and shall expire at midnight on the date which is fourteen (14) years after the day before the Commencement Date, subject to extension pursuant to Article "3" hereof ("Expiration Date"). The term "Lease Year" shall be deemed to mean each successive period of twelve (12) full months following the Commencement Date. B. The Commencement Date shall be _____________, 20__. Provided Tenant is not in default beyond any applicable grace or cure period of any of its obligations under the Lease at the time it exercises its option, Tenant shall have the right, provided (i) this Lease has not been terminated pursuant to the provisions of this Lease or otherwise, and (ii) in respect of any extended term after the first extended term, this Lease has been extended for the prior extended term, to elect to extend the term of this Lease for three (3) terms of five (5) years (each such term being hereinafter called "Extended Term"), each Extended Term to be upon the same terms, covenants and agreements as in this Lease provided, except Tenant shall have no further right to extend the term of this Lease for any period beyond the expiration of the third Extended Term. If Tenant so elects to extend the term of this Lease, Tenant shall give written notice to Landlord of such election at least twelve months prior to the date of expiration of the Original Term or any Extended Term, as the case may be. (b) The option may be exercised only by Tenant giving written notice to Landlord of Tenant's said option by certified mail, return receipt requested, not less than twelve (12) months prior to the Expiration Date of the Original Term or of any Extended Term (the "Exercise Notice"). If Tenant shall not give Landlord the Exercise Notice at the time and in the manner set forth herein, the option shall terminate and be deemed waived by Tenant. Time is of the essence as to the date for the giving of each Exercise Notice. (c) Notwithstanding the foregoing provisions of this Article 3, if on the date that Tenant exercises the option, or if on any subsequent date up to and including the date upon which the extension of the Term commences, Tenant is in default, beyond any applicable notice and grace periods, in the payment of Minimum Annual Rent or additional rent hereunder, or any other term or condition of this Lease, Tenant's exercise of the Option and the extension of the Term contemplated thereby shall, at the option of Landlord exercised by written notice to Tenant, be rendered null and void and shall be of no further force and effect and Tenant shall have no other additional right to exercise such Option, which shall be deemed waived by Tenant. (d) If Tenant exercises the Option, then, at Landlord's request, Tenant agrees within fifteen (15) business days after request is made, to execute, acknowledge and deliver to Landlord an instrument in form and substance satisfactory to Landlord, confirming (i) the fixed annual rent payable under this Lease, (ii) the expiration date of the term, and (iii) the other modifications provided for in this Article 3, but no such instrument shall be required in order to make the provisions hereof effective. The parties acknowledge and agree that this Lease is and is intended to be a triple net lease and the parties hereto intend that Landlord shall receive all Minimum Annual Rent and all additional rent payable hereunder free and clear of any and all liability or responsibility of Landlord for impositions, taxes, liens, charges or expenses, offsets, or similar deductions of any nature whatsoever. Tenant shall pay all costs, expenses and damage which are attributable to Tenant or the ownership, use or possession of the Demised Premises and which, except for the execution of this Lease, would have been chargeable against the Demised Premised or otherwise payable by the Landlord. Tenant understands and agrees that Landlord is to have no obligation whatsoever under this Lease or otherwise in respect of the repair, operation, maintenance and/or replacement of the Demised Premises or for the quality or compliance with applicable law of its construction (or in either case, the lack thereof) with all such obligations being those of the Tenant, at its sole cost and expense. Notwithstanding anything to the contrary contained herein, Tenant shall not be responsible for the Landlord's income taxes, debt service attributable to any mortgage, deed of trust or other instrument, nor any depreciation.